“The Bridges” is a popular walk for many Bremerton residents. Our local Kitsap Sun reporter and community hero, Josh Farley, is hosting three walks today on this loop which is roughly 3 miles. This morning I joined in on the first walk which was the “early bird” focusing on our urban wildlife. We started at the 9/11 Memorial and walked through Evergreen Park , passed the “face” , which I’ve never noticed before and found ourselves at the Rota Vista Park. This is where you can see the largest colony of pelagic cormorants living under the Warren Ave bridge. There is also a pair of nesting Falcons. The walk went over the Warren bridge and along lower Wheaton way past the old Bay bowl and Schley Canyon to the Art Walls which were already being transformed into the next display. We finished at the Domstad Park for a history lesson about Manette and the first bridge. This walk was a wonderful community gathering. It was was fun to hear from other locals, their own personal stories of growing up here. As a third generation Bremerton girl myself, I was thrilled to learn more about my home town. Thank you to Josh for organizing this event and bringing us all together for a shared appreciation of our beautiful city. If you can catch one of the later walks, I encourage you to do so. On a beautiful PNW evening, if you can get in a boat you do. Tonight, we jumped in our little inflatable and cruised to the Boat Shed for a great dinner. On our way home, we had the privilege of being escorted by some local orcas. Always a blast when they show up. Breakfast- can you dig it? When in Bremerton, one of your stops must be breakfast at Hi-Lo’s. Served with love and a smile, they have a simple but delicious menu, a self serve coffee bar out of the back of a van and a pretty impressive thermos collection, I dare you to find a better one. This place is just another wonderful gem in Bremerton. Heidi and Lowell created this colorful and fun breakfast spot years ago and it only gets better with time. Be sure to reserve the VW van for your breakfast table with your group of 4-6. Located on the corner of 15th and Wycoff in West Bremerton. Bringing back the dinner party! Recently, I hosted a dinner party with a group of friends. Entertaining can be fun and doesn’t have to be stressful. The fun part for me is decorating and creating an interesting cocktail. I’m an ok cook however….my advice is, know what you’re good at, delegate the rest. Keep it easy. This particular dinner party was with a group of girlfriends, so I asked everyone to bring something and they were happy to do it. I had each friend volunteer for an item. We had a couple wonderful salads, side dishes, a roasted tri-tip, and a beautiful dessert. I made the champagne cocktails and handed them out upon my guests arrival . There was plenty of wine too, so, you know, the essentials were covered. Adding a theme can make it fun. Since this was a ladies only dinner party, I wanted to add pink, in particular, some vintage pink glass cake plates and vase that I had been unable to really add into any other occasion. So our theme was ” Pink at night, ladies delight”. The ladies loved it. It was fall , so I picked up some pumpkins and gourds and spray painted them rose gold & pink , added some fresh eucalyptus, added candles and voila! It was easy and fun to create, and the bonus was I was able to re-use some of the same items for Thanksgiving a week or so later. 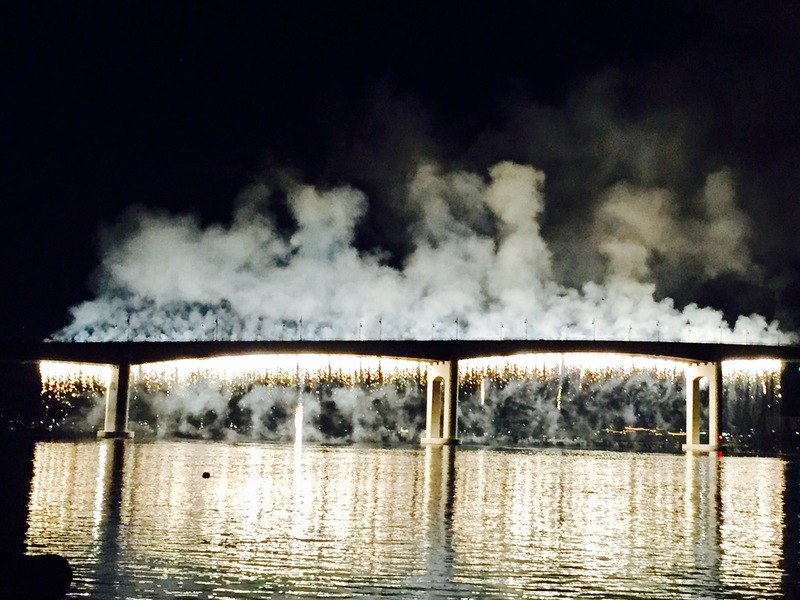 This year was the first year for a fireworks show off the Manette Bridge in Bremerton ….and wow, what a great night. We happened to be down at the Bremerton marina during the day which was hosting many guests. We had fun befriending the very social & fun “West Seattle Yacht club”. The boardwalk hosted live music and food vendors, then off to Manette where businesses were open all day. Manette & downtown neighborhoods and homes were hosting lively parties. Our lucky viewpoint was from a friends waterfront condo, a stones throw from the bridge. Great weather, a perfectly executed fireworks show along with a sprinkling of anchored boats on the water made for a pretty magical evening. Way to go Bremerton. Looking forward to next year. This morning, Bremerton commuters got to enjoy the newest Olympic class ferry named “Chimacum” on her maiden voyage into downtown Seattle. So many Bremerton and Kitsap residents rely on the ferries to get into the city for work every day. The ferries at peak commute times can be very full. The Kitsap and the Kaleetan have been on this run for many years and like any boat has had their mechanical issues. The new boat wasn’t quite ready for her debut yet but due to the shortage and a holiday weekend, they put her into service today. The galley isn’t up and running yet so tonight passengers on their way home won’t be able to enjoy their usual beer or glass of wine but I guess thats coming soon. The other feedback I heard was “where is the makeup counter” … I did hear some say it had the “new car smell”. Lots of these commuters are anxious for the “fast ferry” passenger only service to start in July. Those boats only hold a limited amount of passengers, I believe around 120. This route will take just 28 minutes and give many commuters much needed personal time back into their day. Exciting times Bremerton…stay tuned. I have rang the bell through my service group in the past and that has always been a fun tradition however I hadn’t ever volunteered to count. I was asked to put together a group of friends and sign up for a night in December. Our group of ten or so arrived at the Salvation Army around 7:45 last night as the kettles were being brought in from all over the county. As we began to get our kettles ready, we were given a brief coaching on the process. We all began to open our kettles and begin the counting when around the table we started to hear…”there’s a check in mine”, followed by a cheer. “I’ve got a twenty!” ..cheer! Dollars, fives and change are the most common donation, but the occasional twenty or hundred would also get our crowd roaring with excitement. As we proceeded through our 40 some odd kettles that night, one of our volunteers found a bank envelope in one of the kettles. No name, just a date and a large cash donation….clapping and cheers ring out!! This was an exciting moment not only to find an envelope with a substantial amount of cash in it, but to find that this donor had done this three times yesterday, in three different locations through out the county. Opening a kettle with one of these envelopes inside felt like winning the lotto! What struck our group the most was the heart of this donor, no recognition for his donation, no tax deduction, just the pure and simple happiness it must have brought him or her to donate. Our community is generous. It’s generous with its resources, it’s time and it’s talent. Last night, again, I felt lucky to be part of this community, this family, that takes care of one another. The holiday spirit was in full force and I was lucky enough to bear witness to it. If you’d like to donate or volunteer your time, please contact our local Salvation Army for more information. Love of vintage French comes alive through local collaboration. Three local women have combined their unique talents to create a limited edition book of all things vintage French. Bremerton’s own Wendy Dreaney, who’s career and wanderlust has taken her all over the world, was approached by Liz Le Dorze, the owner of Hattie Rose, (which specializes in beautiful French pieces) to showcase her fine art prints of French flea markets. After further discussion, Liz encouraged Wendy to create something special, a book, to showcase the fine art prints of the many flea markets that Wendy had explored all over France. Hattie Rose is filled with unique pieces, hand selected with a discerning designer eye and complimenting line of Komedal Cloth textiles. This was a perfect fit. Now inspired, Wendy was seeing how this book could come together. She reached out to Marit Bockelie, owner of The Bremerton Letterpress Company to help bring this idea to life. Wendy knew she wanted the end sheets of the book to mimick the vintage French linens, like the ones she has all over her home, however, she couldn’t find paper that looked like it. She reached out to illustrator Toni Santos, of Baby Buddha Studio, who then hand painted all of the end sheets for the book. This trio of incredible talent has now brought this limited edition book to life. There will be only 20 books for sale. These very special books, along with Wendy’s fine art prints, will be available starting November 4th, from 6pm to 8pm , at Hattie Rose, located on Winslow Way, Bainbridge. They will also be available at The Bremerton Letterpress Company on Pacific Ave in downtown Bremerton. This is the first of what they hope will be at least 3 volumes of handmade books created in collaboration between Wendy Dreaney Photography , The Bremerton Letterpress Company and Baby Buddha Studio.